Crooked and crowded teeth are a very common complaint. This can be the result of drifting or shifting teeth. Notwithstanding the poor aesthetic quality, uneven, crowded, crooked and or overlapping teeth, can cause serious oral health problems such as periodontal disease, cavities and uneven wear. Our cosmetic dentist will transform your Crooked teeth into a perfect smile using cosmetic dentistry to create Instant Orthodontics. The patient thanked us for giving her the beautiful smile she always wanted but thought was unobtainable. She said that If someone offered her $100 000 to go back to the smile she had, she wouldn’t take it. Brad was unhappy with his crooked, chipped discoloured teeth. Our cosmetic dentist transformed his smile with a gum lift, whitening and crowns. Max was unhappy with his crooked, overlapping and discoloured teeth. Max’s teeth were whitened and crowns were placed on his front teeth by our cosmetic dentist. Max loved that our office was both professional and friendly. Theresa was unhappy with her crooked smile but did not want to get braces. 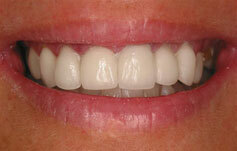 Theresa’s smile was transformed by our Our cosmetic dentist with porcelain crowns. Steve was unhappy with his discoloured and crooked teeth. Our Our cosmetic dentist used a combination of orthodontics and cosmetic bonding to transform his smile from ordinary to extraordinary. Steve quit smoking because he never wanted to have discoloured teeth again. 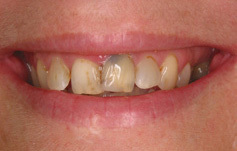 This patient hated her teeth and never wanted to smile. Ellen had orthodontics to get her bite into alignment, our Our cosmetic dentist removed her baby teeth and then finished the case with crowns to close the gaps. The patient thanked us for our patience, understanding and brilliant workmanship. She said that she was over the moon with the results and that her new smile had changed her life.